WHAT IS IT ABOUT NARCISSISTS THAT IS SO IRRESISTIBLY ATTRACTIVE? Like moths drawn to flames, us empaths seem to have a penchant for flying head-first into dangerous friendships and soul-sucking relationships that leave us feeling exhausted and unhinged. And yet, over and over again many of us fall into the same trap, often missing the vital life lessons being presented. Almost every week Sol and I receive emails inquiring about the dynamic between empaths and narcissists. Having been burned by a number of different types of narcissists myself, I know just how easy it is to fall into the heavy gravitational pull of such people. Like black holes, narcissists eat away at your emotions, physical health and sanity, profoundly manipulating and messing up your perceptions and sensibilities. Why is it that empaths and narcissists – two diametrically opposed types of people – feel an almost magnetic pull towards each other? There are many theories, but at the heart of it, I believe that it is Life’s way of restoring balance. For example, let’s examine your typical empath. By nature empaths are deeply caring, compassionate people. The empath’s purpose in life is to support healing in others, yet due to their intense sensitivity, empaths often struggle to create healthy boundaries for themselves, giving in to martyrdom, victimhood, co-dependency, and chronic self-sacrifice. Now, let’s examine your typical narcissist. Due to various traumas, core wounds and conditionings, narcissists hide behind an idealized self-image which is expressed as being highly charming and attractive, yet deeply uncaring, indifferent, self-centered and cruel. Put empaths and narcissists together? Both come in contact with their “inverted/reverse” selves, and both are forced to learn, grow and heal as a result of such an experience (although this doesn’t always happen immediately, but through trial and error). 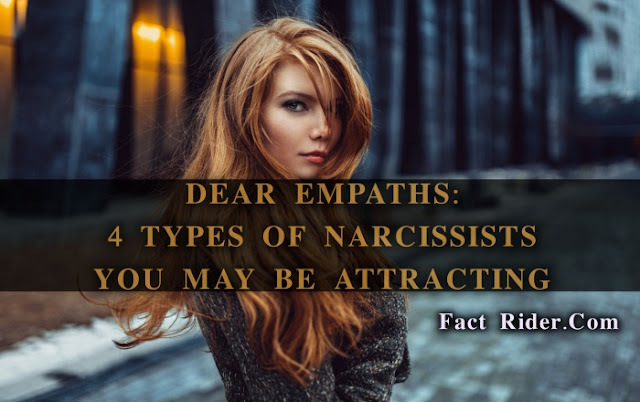 However, it is important for empaths to realize that they can never “heal” the narcissists in their lives – any form of healing must originate within narcissist’s themselves. So many articles out there talk about “protecting” yourself from narcissists. Unfortunately this language promotes the disempowering notion that “other people are out to get you.” They’re not. People act within the limits of their conscious capacity, and sometimes that involves hurting others. The more you perceive yourself as a “victim” of narcissists/narcissism, the less capable you’ll be of truly owning your personal power as an empath. A big part of owning this personal power of yours is learning how to identify different types of narcissists. The more conscious you are of them, the more consciously you’ll be able to behave and make decisions in their presence. These people are generally very sensitive and tend to be quiet or shy by nature. Yet to disguise their chronic feelings of self-hatred and unworthiness, VN’s overcompensate by putting on a grandiose mask, seeking to merge their identities with other idealized people. VN’s have an unshakeable need to feel special about themselves and have little genuine regard for the feelings of others. VN’s are primarily motivated by fear of rejection and abandonment, thus don’t have the capacity to authentically love and care for others. Additionally, VN’s use emotional manipulation (such as shaming, guilt-tripping and gaslighting) to secure sympathy and attention from others. Their lives are fuelled by inferiority complexes which often stem from childhood mistreatment. These people reflect the traditional image of the narcissist: that of a highly self-confident person, cold and unempathetic person. IN’s, unlike VN’s, are thick-skinned and shamelessly seek for power, glory, recognition and pleasure. IN’s often suffer from god complexes, believing themselves to be far superior to everyone else – and they have a pathological need to make that known. Both types share similar traits such as using others to fuel their narcissistic delusions, blaming and criticizing, lack of empathy, unfaithfulness and the need for power. Amorous Narcissists measure their self-worth and grandiosity by how many sexual conquests they have under their belt. This type of person is known for using his/her charm to ensnare others with flattery and gifts, but then quickly disposing of them once they become “boring” and when they have met the narcissists needs (often sexual or image/status orientated). Amorous Narcissists are the ultimate relationship con artists, “gold diggers” and heart-breakers. At first glance they appear highly attractive, alluring and amiable, but underneath they are only out to please and satiate their own needs and desires. Driven to compensate for past traumas, Compensatory Narcissists love creating larger-than-life illusions of themselves and their achievements. In order to regain power and control over their lives, this type of narcissist usually hunts out emotionally vulnerable people who will serve as the audience to their fabricated stage acts. In reality, this type of narcissist is extremely sensitive to criticism and will frequently look out for negative self-directed cues from others. Emotional abuse and manipulation is a common method of control used by this type. This breed of person does anything to climb to the “top,” win and completely dominate others. Elitist narcissists are convinced that they are better than everyone else often due to their achievements or backgrounds (or simply the fact that they were born that way) and thus deserve special treatment. Their sense of entitlement bleeds into every area of life, from work to the family environment. Harboring a severely inflated self-image, Elitist narcissists are skilled self-promoters, braggers and one-uppers. They have a cut-throat need to be the “best” and prove themselves to be intellectually superior all the time and at all costs. The behavior of malignant narcissists often overlaps with that of psychopaths and those with antisocial personality disorder. Malignant narcissists often have no regard or interest in moral vs. immoral behavior, and don’t feel remorse for their actions. This subgroup is characterized by an arrogant and inflated sense of self-worth that delights in “outsmarting” others. This type of narcissist can often be found in prisons, gangs and drug rehabilitation centers, although many manage to run afoul with the law. The most powerful way to regain your personal power as an empath in the face of narcissism is learning how to respect your needs, desires and boundaries. Often this involves severing contact with such people. I recommend reading this article for further direction. Finally, I KNOW that there are so many empaths out there currently struggling to catch a breath of air in the large murky ocean of narcissism saturating their lives. If you are one of these people, I hope that this article can be a starting place to help heal your life. You’re also invited to unload your experiences in the comments area (rants and emotional catharsis encouraged). On the other hand, if you are an empath that has successfully learned to deal with narcissists, please take some time to share what you’ve discovered below. You never know … you comment could help to salvage another’s life.